A superb walking safari in magnificent remote mountains. This is not a nature reserve, so you meet Samburu people living real lives as well as the animal life – and observe their successful co-existence. As of 2017, there are said to be only two walking safaris in Kenya, as a result of safety concerns. This one explores the fine landscape of the Matthews Range in northern Kenya, a place so remote that you can only really fly in, most likely to a rough landing strip which has been hand cleared by Helen Douglas-Dufresne, who is safari queen of this area, and her partner Peter Ilsley. The Matthews and their northern neighbour the Ndoto range are separated by the Milgis river – or rather, its huge, sandy bed. They are roadless except beside some of the big rivers, so support from a camel train is the most practical means of long-distance exploration. The landscape is very varied, from the wide beds of the main rivers, to thick riverside bush, to the sparse, dry thorn forests of the lower slopes, to the steep flanks of the range, to its surprisingly green highlands. Animal life includes elephant, buffalo, lion, leopard; hyrax; assorted lizards and snakes; and birds galore, including bee-eaters, hornbills and various raptors. This is not a wildlife reserve, though, which means that the wildlife co-exists with the Samburu tribal people, who now “get” the value of the wildlife to them despite the competition with their flocks and herds, so join the conservation efforts. Helen has been very instrumented in this. Her charity, the Milgis Trust, works for this co-existence, for instance paying locals to dig waterholes in the riverbeds in times of drought. 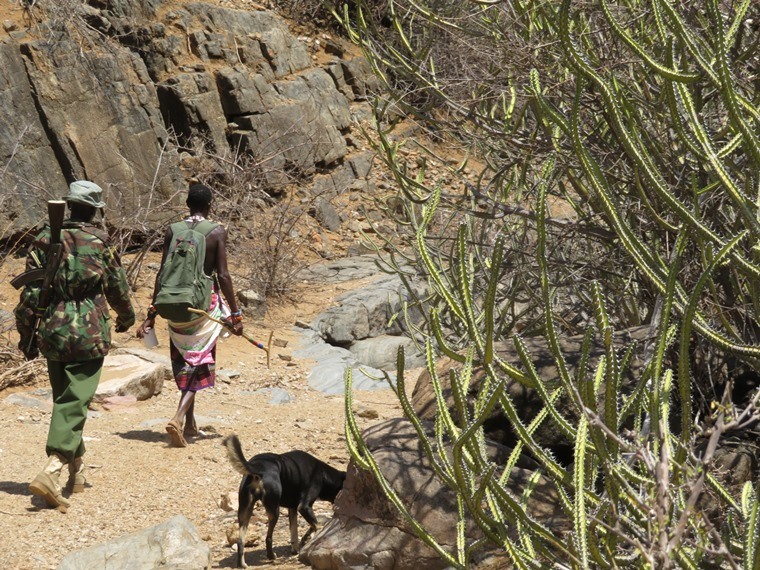 Part of the fascination of walking here is seeing and interacting with the Samburu people, those you meet en route in their bomas or driving their cattle, but particularly the cameleers and other expedition members, who you see at work and leisure; naturally, not on display for tourists. Most of the walking is on droving trails and animal tracks, so can be adjusted to create the perfect expedition for the time and energy levels available. You will spend time on riverbeds of varying sizes, which make easy walking, albeit very hot out in their larger expanses in the middle of the day. More enjoyable are the riverside, bush and hillside paths which link the main rivers. On the high ground you get big and grand views of the silent, dry landscape. A feature of a walking safari is that you see fewer animals than if you are in a vehicle in a game park, but that doesn’t matter. It feels real and close, and you get much deeper into the landscape and environment. Most nights are spent on the banks of dry riverbeds, many of them hundreds of metres wide, from which you can see the light changing and with luck elephants and other animals coming out for water. The camping is a delight: the huge camel train (35 of them for our group) delivers delicious food and drink and comfortable tents and showers, although it would thankfully never count as glamping. The campsites are immensely atmospheric, and sitting with a GnT as the sun goes down after a long walk can only create deep contentment. Helen is the only person organising walking safaris in the area – she says she has never met another group in her 30 years in the area. Her firm is Wild Frontiers. The machinery of their expeditions runs silently and very smoothly: so much is done for your comfort and interest, but you never see any fuss – just lots going on. Woken, disorientated, at 6.30am by an insistent alarm. I remember reasonably soon where I am – in the Aero Club at Wilson airport on the edge of Nairobi. Time is short before we are picked up for our flight, so I drag myself up, blearily – it was bed at 2am – for a rushed pack.